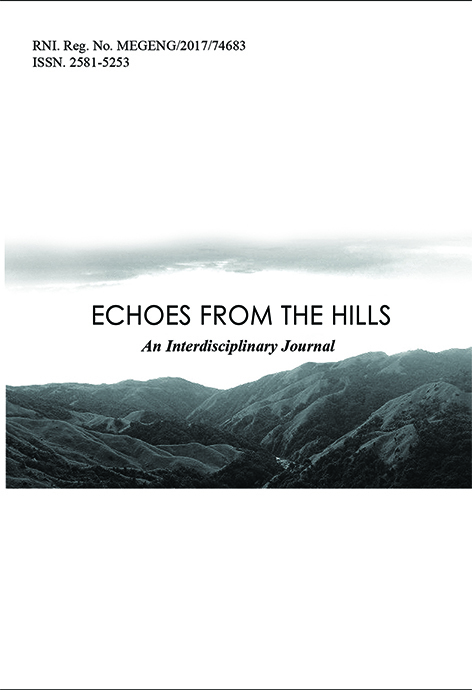 “Echoes from the Hills” is an interdisciplinary peer reviewed, annual academic journal. The term “interdisciplinary” connotes improved communication across disciplines that foster mutual understanding. This, in turn, advances our understanding of the deeply complex issues that underpin contemporary society. Acknowledging the need for diversity and integrity in speaking to these issues, Echoes from the Hills publishes manuscripts from a wide range of disciplines and encourages approaches to topics that use multiple and mutually supporting forms of analysis. The journal is committed to showcasing and publishing innovative scholarly writing from established and emerging academicians and professionals around the world with a hope to promote dialogue, reflection, inquiry, discussion, solutions and action. The Annual academic journal which is Interdisciplinary in nature will focus on a theme to allow a holistic representation of works from different aspects. Assistant Professor, Department of Sociology, Shillong College. Assistant Professor, Department of English, Shillong College. Associate Professor, Department of English, Shillong College. Department of Commerce, Shillong College. Department of Zoology, Shillong College. Department of Chemistry, Shillong College. Department of Sociology, Shillong College. Department of Computer Science & Application, Shillong College. This volumes' theme is entitled "Society and Social Changes" which is done on the basis of the encouraging responses we received from our contributors, who have in their papers discussed, examined and analysed issues and ideas pertaining to society and the social changes therein. Change is a constant phenomena. Society is transforming and modernity has had a deep critical impact on social, economical, political, cultural and environmental sectors across the globe. As an idea it represents a radical rupture with the past. Todays, modern environments and experiences cut across all boundaries of geography and ethnicity, of class and nationalty, of religion and ideology; in this sense modernity can be said to unite all mankind. Further,in this modem society powerful trends are reshaping businesses,driving new technologies, shifting talent needs,changing human behaviour etc. It is therefore crucial for all to stay up to date with these changes, and respond accordingly.Hence this second issue of Echoes from the Hills 1s themed: "Modern Environments: Emerging Trends". We therefore call for papers that focus on these emerging trends that will not only keep a realistic assement of the problems and issues but at the same time evolve well planned strategies to address them. The last date of submitting papers is the 1st of November, 2018. Authors of papers are requested to adhere to the Submissions guidelines. Please read the instructions carefully before submitting an article/ paper for review and publication. Follow the instructions given while preparing the paper. Authorship of the paper should be limited only to those who have made significant contribution in the concept, execution and finding of the research. Plagiarism should be avoided at all cost. Submitting the same paper to more than one journal/publisher is against the ethics of the journal. Due acknowledgement should be given to other’s works that influenced/shaped the research. The paper should contain sufficient details and references for other readers/researchers to augment it. The journal publishes texts in English with both UK and US spelling, as long as it is consistent. Submissions should follow the Chicago Manual of Style (16th edition)/ MLA Style (7th edition), be sent as MS-Word files (.doc/.docx) single spaced and format all referencing to references/endnotes/ works cited accordingly. (Footnotes are to be avoided). The journal accepts all original works (research papers/articles/ book reviews/interviews) and the submission must be only via e-mail as attached documents (single attachment). Articles/papers/book reviews/ interviews submitted should be relevant to the thematic concept of each volume of the journal. As we publish only original works, authors are required to check that it does not contain plagiarized material in it and the responsibility lies solely with the author in case of any plagiarism. Any work with evidence of plagiarism might be removed/ rejected at any stage. The entire text should be typed in Times New Roman/Arial; font, size 12; 1.5 spacing, and justified. Full Title with subtitle, if any, in bold letters and font size of 14. Name and Affiliation of the Author/s, contact details & e-mail should be on the first page. An abstract of the article of about 120-170 words, with 5-8 keywords. There is no fixed word limit but it should be around 2500-7000 words, inclusive of Works Cited and Tables. Word limit for Book Reviews, 750-1500. Reviews should be accompanied with a copy of the book/work reviewed (soft copies allowed). Author/s should be careful regarding grammatical and typographical errors. Quotations/citations in languages other than English are to be supplemented with translations and font files. Authors should send the paper in PDF file also, in addition to the MS Word file in such cases. Papers with phonetic symbols or other such texts should be accompanied by a PDF file. Page layout should be in A4 size, portrait layout, 1inch margin on all sides. Tables/Charts/Diagram, if any, should be clear and well incorporated in the given page layout. The complete article should be followed by a brief bio-note (50-120 words) of the author/s. Finally, the file should conclude with the author’s declaration as mentioned in Submission Guidelines. Papers are peer reviewed before publication in “Echoes from the Hills”. The process is initiated after the paper has been checked as to its completeness and meeting the criteria for the journal. The authors remain anonymous to the editors who review the papers and vice versa. Even after the process of review and revision made as per the guidelines of the reviewer, the revised papers will undergo the same process of review. The main criteria for acceptance lie with originality, consistency, integrity, broad context, readership relevance and style. The Editorial Board reserves the right to edit any work submitted (if necessary). However, the final authority for publication lies with the Editorial Board of the journal. Modifications and changes, if any, which the author/s would like to make in the papers can be communicated by e-mail before publication. Articles and other original works are accepted throughout the year (see http://www.shillongcollege.ac.in/journals) and response time is a week. Review would take 3-5 weeks, depending upon the quality of the paper and the response from the reviewer. Once accepted by the editors, acknowledgement would be sent within a couple of days. The journal charges no fee for any publication. Copyright © is reserved with The Principal, Shillong College No part of this publication may be reproduced, in any form or by any means, electronic, photocopying or otherwise without permission in writing from the publisher. View expressed in the article(s) in this journal are personal opinions of the contributors. Neither the Publisher nor the Editorial Board of “Echoes from the Hills” are responsible for them. Notwithstanding the effort to ensure precision and reliability of the contents in the articles yet the Editorial Board accepts no responsibility for veracity of claims of information provided by contributors. Individual authors can reproduce the work in other publication/s with an acknowledgement of its first publication in this journal. SubScribers are requested to send their order with the duly filled subscription form and payment whenever possible. Issues will be sent on receipt of payment only. Payments can be made by cheque/Demand Draft in favour of Principal,Shillong College payable at Shillong.